More information about the Beagle Walking Stick Umbrella. 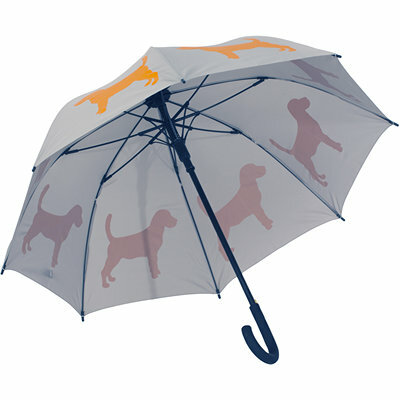 "Beagle Walking Stick Umbrella: This high-quality walking stick umbrella features silhouettes of adorable Beagles. This umbrella features a 14mm steel shaft for extra strength and rigidity, coated black for rust resistance. This is the backbone of the umbrella which, along with the matching steel cap, gives it the robustness to be used as a walking stick. Other features include a rubberized crook handle for a comfortable grip and an automatic opening mechanism with a heavy duty spring for added durability. The Teflon-coated, waterproof canopy opens to a full 48"" arc while the fiberglass ribs provide an extraordinary degree of wind resistance not found with typical metal ribs. UPC: 661799660228 EAN: 0661799660228"